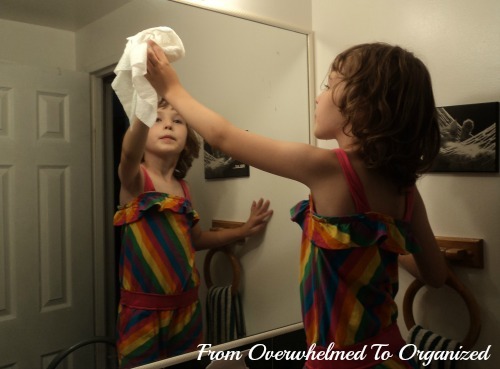 Do you struggle to get your kids help you clean the house? Are they expected to contribute to the upkeep of your home? Do they have a cleaning routine? 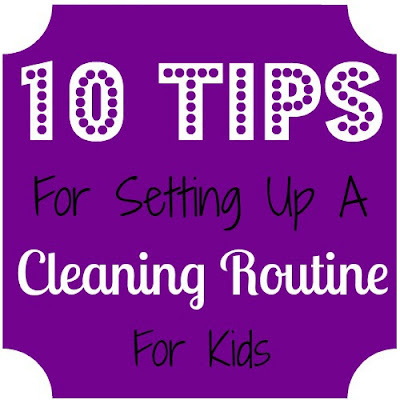 Today I'll share how I organized our cleaning routine this summer and some tips to help you set up a cleaning routine for your kids. Why Should Kids Help Clean? It helps them make less mess. I don't know about your kids, but mine are messy. And they don't usually see the mess. Piles of dirty laundry. Crumbs on the floor. Toys on the living room table. Dirt from their shoes in the hallway. Stains in the toilet because they forget to flush. And so on. And that doesn't include the stuff they don't contribute too, like cat hair and dust. By getting them involved in helping clean the house, they've become a little more aware of the mess in our house. That's helped them make a little less of it. And that's a good thing. Kids feel important when they are a contributing part of the household. Sure they complain about having to clean, but they also feel proud when they do. This summer my kids kept wondering if their dad would notice what they cleaned when he got home. If he didn't... they were sure to tell him. And if he did... wow... big smiles all around! I didn't start out giving all those reasons to my kids. Mainly this summer I told them if they wanted me to do all the fun stuff they wanted to, then they had to help me with the cleaning. But more reasons came out as time went on. At the top I listed the things we were each responsible for. They've already been doing a few things every day/week and they were expected to continue doing those. I found it hard to put on paper all the things my hubby and I actually do, because we're pretty flexible about a lot of the things on our lists, and it varies a lot depending on his work schedule, but this was a start. Then I broke down the cleaning tasks that I thought the kids could do into small, manageable pieces and scheduled them into a bi-weekly schedule. Our schedule alternated each week between home weeks and camp/VBS weeks, which ended up working really well for our cleaning routine. I put the shortest tasks into the camp weeks because we did those tasks before leaving in the morning. And the longer tasks into the home weeks since we weren't rushing to get out the door those days. Our basement is where our cat spends most of her time... and where she sheds the most. And in the summer we spent a lot of time down there because it's the coolest place in the house. Temperature-wise that is... although it's a pretty "cool" place to hang out too :) Anyway, it needed to be cleaned weekly. The rest of the house could manage with less frequent vacuuming most of the time, with some sweeping in between. 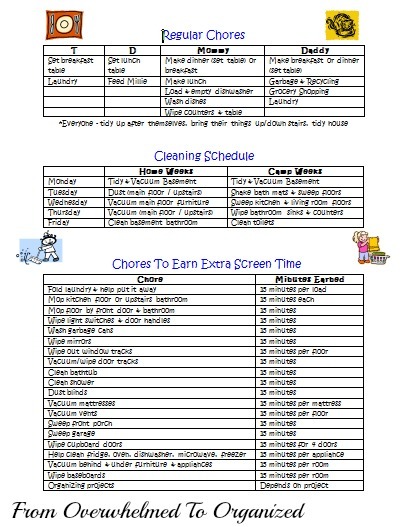 On the bottom of the page, I listed several cleaning tasks that they could do to earn extra screen time. These were cleaning tasks that didn't need to happen on a particular schedule. Some I just wanted done once in the summer (spring cleaning type tasks that I didn't do this spring). Others were just ongoing tasks they could do any time they just wanted to earn a little extra screen time. I'd planned for each task to take about 15 minutes (or maybe a little longer at the beginning when they were learning it) and overall that was a pretty good estimate. Except for vacuuming the floors. Definitely misjudged that one! So I changed it to each of them vacuuming one room to make it less overwhelming. Then I'd finish the rest. Some cleaning tasks my kids took on were ones they had done before, but some were totally new to them. The new tasks required some training and there was definitely a learning curve. I quickly realized that if I wanted to keep them motivated, I had to lower my expectations. Like folding and putting away laundry. Plenty of clothes were a little more wrinkly than usual, and their drawers were a little lot messier. No photos of pretty drawers taken recently! But it's summer so who cares if a t-shirt is a little wrinkly? The point is they are learning. And with thousands more loads of laundry in our future, I think the learning curve is worth it! By the end of the summer, I was pleasantly surprised at how much they had learned and improved in all the cleaning tasks they had taken on! They liked some chores more than others. Believe it or not, both of their favourite places to clean were the bathrooms! It was a bit tough for them to maneuver the vacuum and they found it hard to cover the whole floor (they tended to do it fairly haphazardly and missed a lot of areas). Plus their speed did not increase over the summer, like it did for other tasks, which only frustrated them more. And they're only 9 and 6. I'm sure when they're a bit older vacuuming will be easier. We didn't get all the tasks from the "Extras List" accomplished (I'll be catching up on some of them this fall! ), but I'm happy with the results and will do this again next summer. Could I have done some of the cleaning quicker and better than my kids did this summer? Sure. Would they have learned as much as they did if I'd done that? Nope. So, despite a few many complaints from my kiddos, I think it was worth it. Take time to show them how to do the task, and repeat as needed until they know what to do. Make it clear what you expect it to look like so they know what to strive for. Lower your expectations initially. They're kids... and they're learning. You wouldn't expect them to ride a bike or bake a cake as well as you right away, so don't place unrealistic expectations on them for cleaning. Resist the urge to "do the job right" after they clean something. Or if you really need to do a better job, make sure you do it later and that they don't see you do it. You want them to build confidence and pride in their skills and if they know you'll just re-do it later anyway then there's no motivation for them to improve. Keep the whole experience positive. Especially early on. Praise their efforts and help them feel proud about what they've done. This goes a long way toward motivating them to do their best next time. If you haven't involved your kids in cleaning but want to set up a cleaning routine, which of these tips do you think will help you the most? If your kids do help you clean, how did you teach them? What tips can you share for setting up a cleaning routine? Check out all my summer posts here! Great tips! I'm a big fan of getting kids to work - I have teenagers now - that's when it will really pay off! They can do most jobs quite well now, and they have been doing chores for so long, it never occurs to them to NOT do them. You've done your kids a huge service by teaching them how to work! Well done! Thanks Laura! I'm glad to hear it pays off so much later :) Good job with your kids! I agree with you and Laura above - it's a great idea to get them started when they're young. Mine know that it's work, but they also know they need to help out just as part of being a good family member. My youngest actually loves to clean toilets, I don't ask, i just let her do it :) Their rooms get ridiculous at some points during the year and so together we go through all their stuff, and donate things and put things away for awhile and at some point i leave them to finish the room. At the end they love how clean it is and find that they've enjoyed the organizing part of it. So i'm raising mini-organizers, which is awesome. 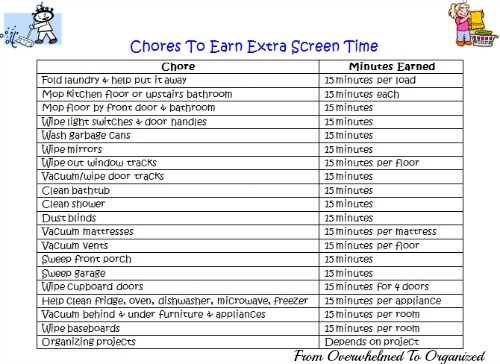 I try not to be a taskmaster about chores..they do them, they get to play ipod or something or watch tv..if they choose not to do them..that's fine, but there's no tv or ipod, etc. It's simple and straightforward. Thanks so much for the award nomination Katelyn! I've received this one in the past and it's so wonderful to be encouraged this way. That's so great that your kids enjoy helping out at home! Good luck putting together a routine for them! This is fantastic, Hilda! Pinning so I can re-visit the details again very soon. Thanks Linda! Hope it helps you out! I already have my 17 month old help me put away his toys. Sure it takes forever and he usually gets distracted and starts playing with one, but I think it's a step in the right direction. This is really good. 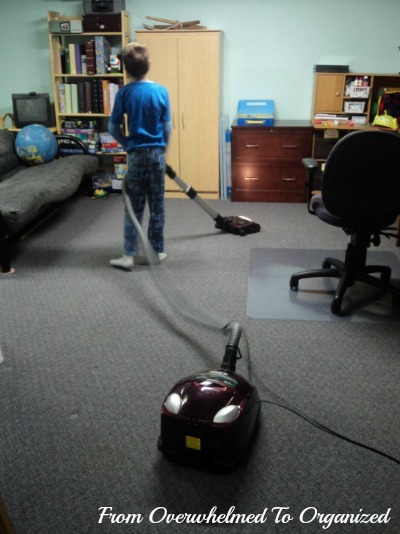 Having kid to cooperate with house chores is a brilliant idea! I love the way you give them things to do rather than to sit and play around all day.